The gallbladder is known as “dan” in Chinese language and it means courage. In the West, when we may say “the gall of you!”, similarly to saying “how dare you!”. If a person has a small or weak gallbladder, it implies lack of courage, timidity, fear and indecisiveness. On the other hand, a person who is impulse, short fuse and constantly react out of anger could be also having an imbalanced or large gallbladder. A strong and balanced gallbladder helps a person to be more assertive, stable and decisive. When a person has a small gallbladder, she will find difficulty digesting food that are high in fat. Therefore, sometimes she can feel very bloated after a heavy and fatty meal, or sometimes there can be pain indicating that there could be gallstones forming. Many people do not want to go for the operation to remove the gallbladder- and therefore they wanted to try holistic method like the gallbladder flush or cleanse (but of course, when the situation has become critical, there is no other option but to operate). But before things get out of hand, the initial signs are usually there. Hard to digest fatty food, the ultrasound indicates a small gallbladder. Don’t be disheartened- there is hope and what you are about to do not only can improve your gallbladder health, but transforms you life as well. Small gallbladder- and therefore not efficient in digesting too much fatty food. The same words used to write “small courage” is also written the same way as “small gallbladder” in the Chinese language. I remember years ago during an ultrasound scan, I was told that my gallbladder was quite small. Well I thought, that explains why each time after I eat a heavy meal, I become so lethargic and sleepy. My stomach felt that it weighed a tonne. As the result, I drank strong doses of coffee in the hope to overcome that sleepiness feeling. The usual premixed coffee don’t work. I needed strong doses of gourmet coffee to stay awake- they worked for a short while but I felt worst than before. The changes did not happen overnight- but as I become less afraid of things, my digestion seemed to improve. I could eat fatty food without having my whole body felt like dead lead. I don’t depend on heavy doses of coffee anymore. Our bodies tend to manifest a lot of our limitations into physical ailments. Each medical condition is often our body’s way of trying to tell us something. Sometimes, people try the gallstone flush and it worked for a while- they managed to flush out the gallstones. 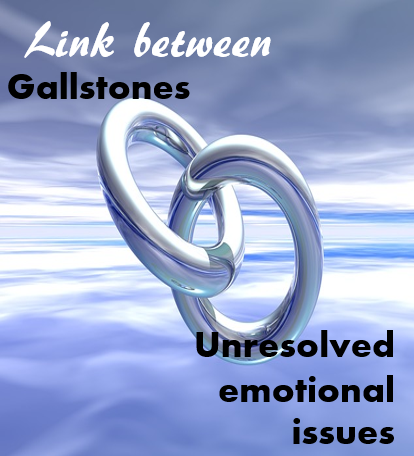 But if the gallstones kept recurring, it’s time to look into the mind body connection of having gallstones. Louise Hay mentioned that gallstones could be tied to bitterness, hard thoughts, condemning or pride. Over the years, these unexpressed emotions could solidify into gallstones. And if it causes a lot of pain and inflammation, it also represents the seething anger. What could be causing us to be so bitter? Could we find in our hearts to forgive? Everyone tries to live their lives the best way using what they’ve been given and conditioned. They may hurt us in the process. And we can see that holding on to that resentment and bitterness ain’t doing us any good. We are now in pain and the prospect of surgery (which we may need to fork out our own money) is in the horizon. The person could be now enjoying life and oblivious to our suffering. And here we are, suffering by ourselves. Is it worth it? Let go of the anger. Soften our hearts- forgive. In forgiving the other person, we also forgive ourselves. We forgive ourselves for making the mistake of trusting and loving the person. It’s time to learn from the mistake and betrayal and move on in life. Look around- there is still a lot of goodness in the world. They are many others who are kind and love us- let’s not make a bad experience ruin life for us. Disclaimer: Seek professional medical advice if the pain is severe. Don’t self medicate. Here’s a medical article written about gallbladder and gallstones, published by the Star paper a year ago. thanks for taking the time to write this piece in a way that is balanced and encouraging. I agree totally with this. I love Louise Hays work. Hard thoughts hard stones. Doctors are starting to see these connections slowly. I am surprised hospitals in 2018 cannot simply remove the stones (from the galbladder). I find it shocking and dated that they cannot. They claim its simple and easy vis key hole. But its not good enough. They claim it cant be done re removing only the stones but they need to work harder. Surely using Ercp up dated verson they could pull the stones out . Then the patient adjusts diet ie too little oil can cause galstones or too much . Also crash diets can cause the problem too. Removing the gb is too extreme should be, by now a thing of the past. I found spending time perday holding hands over the gb area saying to self: its ok I know you have been through a lot. But Im here now helps me. I hear gurgling sounds and feel a release. Visualuse stones disolving and moving out of the body with your hart rythm. Apply cyder vinager three times a day neant to help disolve them. My blocked stone moved out of the body. I feel my gb is my childhood self so it needs love as familt had a lot of issues. I use no oil now :just 2 wal nuts perday. Some times half a half tea spoon of flaz seed oil. I cheeck products avoid anything with oil. Skimmed milk only. Im nice n slim but lost a lot of weight. Der Der its ok . Im listening. Im here. And Love and energy. Lots of light by the window. Walks. Be kind to self and others. Thanks so much for sharing your experience. So glad that you have managed to remove your block stones. Usually if there are stones they would remove the entire gallbladder. Recently I have read that the gallbladder relates to the control aspect of their lives from Chinese energy systems point of view. Those who have their gallbladder removed would feel they have lost control.